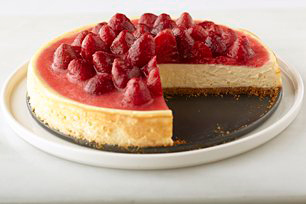 Everybody loves cheesecake, so here's a classic cheesecake recipe to try! Ready to bake in just 20 minutes, this luscious graham-crumb-crusted cheesecake is topped with strawberries just before serving. Mix graham crumbs, 2 Tbsp. sugar and butter; press onto bottom of 9-inch springform pan. Bake 10 min. Meanwhile, beat cream cheese, lemon zest, juice and remaining sugar in large bowl with mixer until blended. Add sour cream; mix well. Add eggs, 1 at a time, mixing on low speed after each just until blended. Pour over crust. Bake 50 min. or until centre is almost set. Run knife around rim of pan to loosen cake; cool before removing rim. Drain strawberries, reserving liquid. Add enough water to reserved liquid to measure 1/2 cup. Mix corn starch and reserved liquid in medium saucepan until blended. Bring to boil on medium heat, stirring constantly. Cook and stir 1 min. ; cool. Stir in strawberries. Spoon over cheesecake. Refrigerate 4 hours. Reduce oven to 325°F if baking cheesecake in 9-inch dark nonstick springform pan. Mix corn starch and reserved strawberry liquid in medium microwaveable bowl. Microwave on HIGH 2 min. or until mixture boils, stirring after each minute. Cool. Continue as directed.